About Two Weeks Ago,My College-mates Reunion was held...The party was going well. One Of My Friends Started the Camp-Fire Conversation with a phrase like "How Was your Cut and Join Job going"? Yes, It is a Cut and Join Job.But Cut out the Bad things and Joining the Un-Related ones and gives the Audience a Feeling With Things That don't have Feelings. ACTUALLY ,Everything is an Editing. Browny Asians are in China,India,.......While the Other Pale Whites are in British, France,......Black In Africa and Pinks are in East......Thats the Editing Work Of Earth Creator. There Are Different Kinds Of Cuts To Fast,Slow up,Freeze the Emotion,Make The Forms,Follow the Killer,Clean Douchebags and Create the Scene in turn Whole Film. Standard Cut - Cut Out Ends And Join Clip Together. Match Cut - Make The Continuity In Unrelated different scenes. A Good Editor Can Save A Poorly Directed Film. A Poor Editor Can Damage Even The Finest Work Of The Director. Editor Is Like A Jesus Turning Bad To Good,Turn/Shapen The Good. 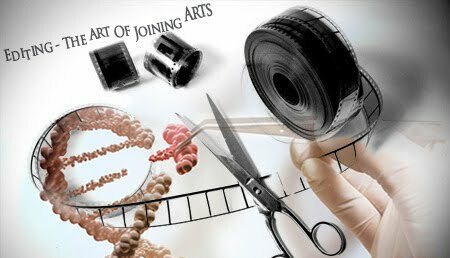 "...Film editing is described as an art or skill, the only art that is unique to cinema, separating filmmaking from other art forms that preceded it, although there are close parallels to the editing process in other art forms such as poetry and novel writing. Film editing is often referred to as the "invisible art" because when it is well-practiced, the viewer can become so engaged that he or she is not aware of the editor's work".- Wikipedia series on Filmmaking. In the meantimes,there Film-makers/Directors also did the job editing that they don't want the other one to did it. Akira kurasawa ,Bahram Beyzi and Coen brothers. In 60s a murder occupy the newspapers and all the media-works,But its not a Reallife murder.A Psycho(1960) Murder by Hitchcock.There is not a great work on the shooting spot (bunch of shots),but in the Editing.It is achieved by Kuleshov effect.The Scene Had 42 Shots Which explains the brutal and horror of murdering a Lady with a knife,Without showing the Actual sequence of Murdering.Even though we comes to the feel of one is murdered hard in the shower while bathing peacefully.And That is Editing. Make Something From Nothing is The Great Phrase We Regard On Editing.It Suits So Well. WHEN DOES INSPIRATION TURNS INTO PLAGIARISM?